Poised to take over the workplace are Millennials who now account for one-third of the world's workforce. Aged between 18 and 34 years old, they are driven, tech-savvy, connected, and eager to push businesses forward. 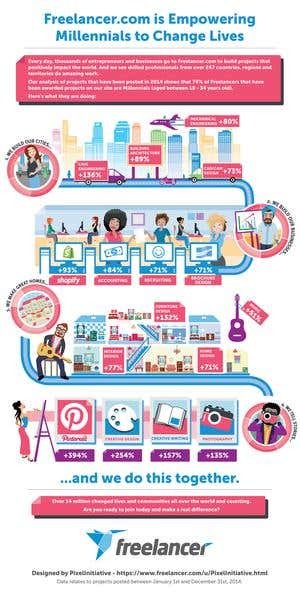 On Freelancer.com, Millennials caused quite a stir in 2014 – 74% of the site's users are Millennials and they were responsible for the thousands of jobs posted last year. This quarter's Freelancer Fast 50 shows how Millennials are considered the biggest industry movers. Bent on shaping their careers and building a better world, employers and freelancers alike used Freelancer.com as a means to break the nine-to-five grind and build collaborative offices around the globe. "In 2014, I spoke at the G20 Young Entrepreneurs's Alliance Summit (G20YEA) where I said that entrepreneurship is the way forward for youth unemployment. Our statistics show that Millennials are at the forefront of taking risks and becoming entrepreneurs by being connected to the internet. Freelancer.com facilitates them to also make a change in their own lives, and make an impact in communities, by helping them start their own business or find work wherever they choose to be." said Freelancer.com CEO Matt Barrie. Freelancer.com's data scientists looked at the projects posted on the platform last year and found four project categories in four areas where majority of the Millennials had a hand in. Building Cities – Engineering-related projects rose greatly in 2014. Building Businesses – Entrepreneurs and SMEs are supercharging their businesses by implementing eCommerce platforms and outsourcing business processes. Making Great Homes – A surprising addition to the current IT-centered lineup, home design projects saw a surge last year. Telling stories – Social Media and Content are still on the rise as tackled in our previous Fast 50 report here. As 2015 unfolds, Freelancer.com will continue to support its Millennials as they strive for success and empowerment. This year is going to be exciting for the site and its more than 14 million registered users! To learn more about the Millennials and the way they work, read the full Freelancer Fast 50 report here.